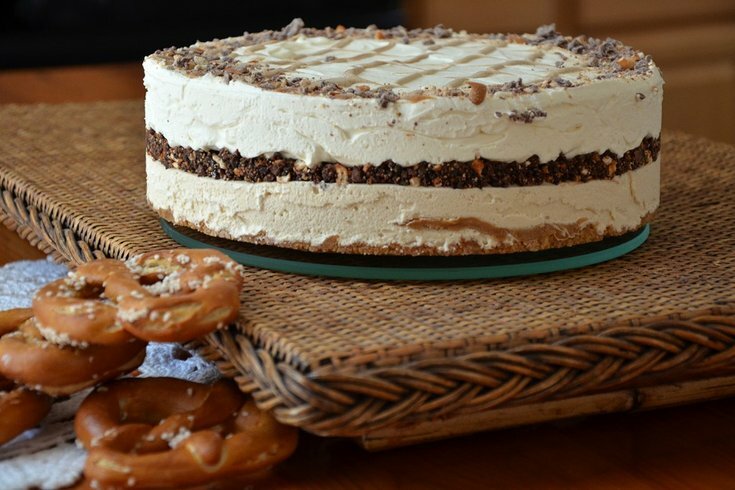 "The Ed Rendell," a National Pretzel Day-inspired cake by The Beese Knees. Local gourmet ice cream cake business The Beese Knees is hosting a free wedding tasting event Sunday, June 28 for local newly engaged couples and event planners. Area vendors and wedding designers will be in attendance to show their wares off for the soon-to-be married. Guests will find light refreshments, live music and ice cream cake samples from The Beese Knees (think seasonal ingredients and fun flavor combos, not those Dairy Queen boxed to-go cakes). They'll be tasting two of the brand's most popular flavors, “Mustachio Pistachio” and “Olde Fashioned,” plus their latest summer menu additions. One lucky guest will even win a free cake. Makeup and hair artist Jessica Saint, ceremonial musician Rob Swift of Swift Lessons, graphic designer JesBender and photographer Maria Teicher of Everyday Eros Studios will all be there. Guests can also win other door prizes, like an engagement session from Everyday Eros or a gift basket from La Colombe Torrefaction.